A record 14,496 collisions between aircraft and wildlife, especially birds, were reported in the United States in 2017, a 7 percent increase from 2016, according to the most recent wildlife strike report from the U.S. Federal Aviation Administration (FAA) and the U.S. Department of Agriculture Animal and Plant Health Inspection Service (APHIS).1The agencies’ Wildlife Strikes to Civil Aircraft in the United States, 1990–2017 says that the total includes strikes recorded in the United States and strikes involving U.S. aircraft in foreign countries (which accounted for less than 2 percent of the total). As is typical, 95 percent of the reported strikes involved birds, with the rest divided between bats in flight, and terrestrial mammals and reptiles on the ground. Despite the overall increase in reported strikes, the number of damage-producing strikes decreased to 625, or 4 percent of all strikes, according to the report, released in January. The decline reflects a trend seen throughout the last decade. The number of strikes producing negative effects on flight and aborted takeoffs also has declined. Despite the decline in damage-producing strikes, risks are sometimes significant. For example, on Nov. 19, 2017, a Bell 407 being used for medical transport was responding to a nighttime call near Stuttgart, Arkansas, when, in the near-total darkness, the aircraft encountered a flock of snow geese. The helicopter suffered numerous strikes and at least one of the birds penetrated the cockpit. It is unclear if the pilot was incapacitated or if the bird strike made control of the helicopter impossible, but the helicopter crashed and burned, killing the pilot and two medical personnel. The National Transportation Safety Board determined that the probable cause of the accident was in-flight loss of control due to bird strikes. There is no single solution. Each situation is different and solutions to the wildlife problem vary accordingly. First, the wildlife threat must be determined by trained personnel — for example, through a wildlife survey. Then solutions to the problem can be developed, with consideration of safety, cost and other factors. Auditory repellent used at an airport. Although there has been considerable success in removing birds from airport environs, new techniques continue to be employed. 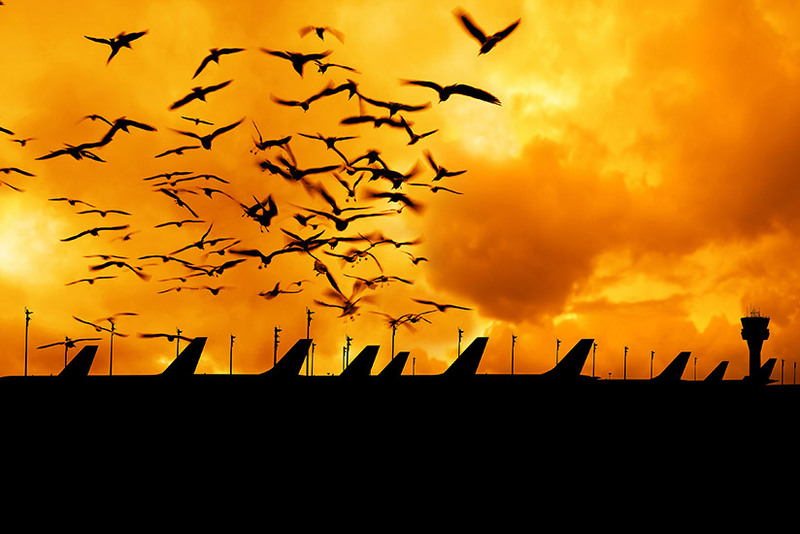 For the immediate airport area, the use of sound to deter birds has evolved from the simple loud noise of explosions from guns or pyrotechnics to audio systems that imitate distress calls or predator attack cries. Another tool involves laser technology. Non-harmful laser beams have been shown to be effective in scaring off birds. Hand-held units can be used by airport wildlife control staff on patrol, and automated systems are available. In addition to using specially trained dogs and raptors, airport wildlife control staff now also use robotic birds and drones to scare away birds. As stated in the report’s conclusions, “Management efforts to reduce the risks of bird strikes have primarily focused on airports since various historical analyses of bird strike data for civil aviation have indicated the majority of strikes occur in this environment (during takeoff and landing at less than 1,500 feet AGL [above ground level]). However, the successful mitigation efforts at [U.S. Federal Aviation Regulations] Part 139-certificated airports that have reduced damaging strikes for commercial aviation in recent years have done little to reduce strikes outside the airport environment.” In fact, strikes above 1,500 ft have stayed the same. The report also recommends that the aviation community broaden its view of wildlife strike risks from a ground-based wildlife management problem to an airspace management problem that also encompasses air traffic control (ATC) and flight crews. Detection and tracking of birds in flight is a major goal. Human surveillance from the tower and spotters in the field will be augmented by radar observation. 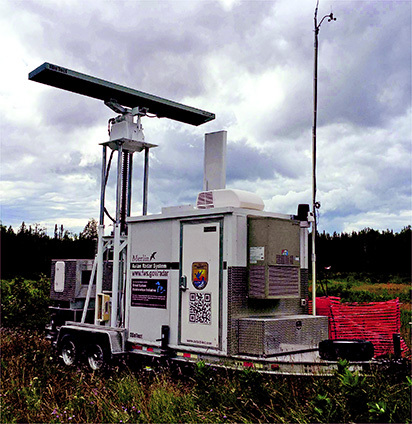 Avian radar, specifically designed to detect birds in flight, is seen as a major technological aid. ATC and pilots of aircraft in flight could be given specific information on the location and movement of a potential threat and preventive actions could be taken. However, recent studies show a mixed bag of results. 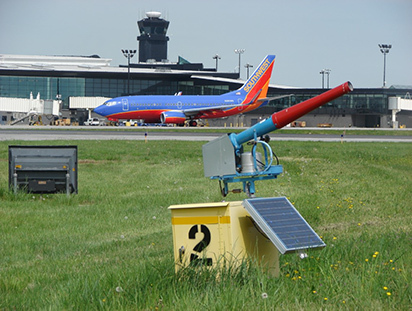 Another study,3 at Chicago O’Hare International Airport, also compared human observations to radar contacts on three avian radar systems used at the airport. Only 15 percent of the birds or flocks spotted by the human eye showed up on the radar screen. Distance from the radar site and the size of the bird were significant factors, with smaller, more distant birds/flocks being less likely subjects for radar detection. Ground clutter also posed major problems for radar coverage. Another stated goal is to integrate “bird migration forecasting into airspace management.” The military already does this with its (Bird/Wildlife Aircraft Strike Hazard) (BASH) program. BASH utilizes the Bird Avoidance Model (BAM), which incorporates data on bird habitat, migration and breeding characteristics as well as environmental and man-made influences. Projects like eBird 4 could prove helpful to the aviation community. eBird, managed by the Cornell Lab of Ornithology, is a database that includes maps, charts and other products that display the range, abundance, habitat and trends for many bird species. Yet another approach is modifying the aircraft itself. 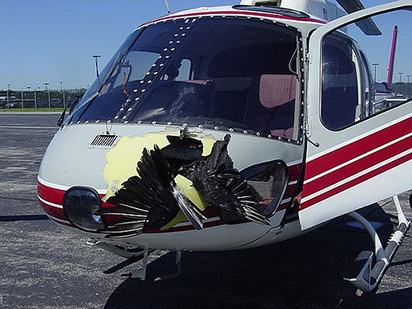 Windshields capable of withstanding a large bird strike have been developed for helicopters. To prevent engine failure, turbine engines in particular are being designed to better withstand the forces produced by ingestion of large and/or multiple bird carcasses. Although commercial aviation has seen significant reductions in damaging wildlife strikes, two sectors of the aviation community continue to have problems. There were 665 reported bird strikes (and one microbat strike) on helicopters in the United States in 2015–2017. The yearly average of just over 200 strikes has been fairly consistent since 2010. Again, the assumption is that many strikes that caused no damage or delays were not reported. GA aircraft tend to fly lower than commercial traffic, thus putting them more in the risk zone for longer periods of time. GA airports, with more limited funding, also have not been able to take advantage of the equipment and techniques utilized at larger terminals. One problem primarily confined to GA airports is that of terrestrial animal strikes. A lack of perimeter fencing allows terrestrial mammals and even reptiles to be a hazard on runways. This threat is not to be minimized. White-tailed deer alone were responsible for more aircraft lost to wildlife strikes (nearly one-third of all aircraft lost since 1990) than any other single species, including birds. Specifically, looking at the numbers from 1990–2017, there were 1,060 strikes on white tailed deer, 879 — or 83 percent — of these strikes produced damage resulting in 250,000 hours of downtime and repair or replacement costs of $47 million. FAA; U.S. Department of Agriculture (USDA), Wildlife Services. “Wildlife Strikes to Civil Aircraft in the United States, 1990-2017.” January 2019. Phillips, Adam C.; Majumdar, Siddhartha; Washburn, Brian E.; Mayer, David; Swearingin, Ryan M.; Herricks, Edwin E.; Guerrant, Travis L.; Beckerman, Scott F.; Pullins, Craig K. “Efﬁcacy of Avian Radar Systems for Tracking Birds on the Airﬁeld of a Large International Airport.” Wildlife Society Bulletin Volume 42 (Issue 3, 2018): 467–477. Cornell Lab of Ornithology. eBird website. Data provided by Phyllis R. Miller, USDA APHIS Wildlife Services scientific data technician. Study says birds’ vision may be less sensitive to red navigation lights.